If he doesn't owe me money, then he's a keeper! It may sound funny, but it is one of the signs to know if you have a real relationship. There's signs for everything including to know if he's a keeper or not. If he’s a keeper or not depends on what you want from a relationship. Relationships are one of the most crucial and momentous parts of one’s life. However, it has become exceedingly difficult than ever to realize if you are in a justified relationship. It is the most common scenario to observe people breaking up over trivial matters. Every time you two break-up, you are uncertain if you’re losing Mr. Right. When you feel comfortable facing him in your pajamas or in your messy hair or when you wake up in the morning, you know he is the right person. If he feels comfortable wandering the streets when you are without make-up, then yes… he is madly in love with you. Appreciate this fact as he probably a keeper. On the other hand, a man who cares will tell you that dress is a mess or you have too much makeup on. Is he a keeper? This is perhaps the utmost controversial topic in most relationships! If your guy respects your space and is not always looking for an opportunity to peek into your phone, this shows he understands you have a life which does not revolve solely around him. If he feels comfortable when you spend your weekend with your friends and not with him, completely aware of the fact this does not mean you don’t love him anymore, he is one step ahead of being a keeper. How to know if he’s a keeper? For me it’s easy. He’s a keeper if he cooks! However, cooking is not as important as trust. Does your boyfriend feel jealous when you talk to your male friends or even when you talk about them? Thankfully, it is alright if he is ‘only’ jealous. Some people think showing jealousy is a sign he loves you. But does he ask you not to talk to your male friends anymore? If so, this is a danger alert! This shows he not only feels insecure but also he does not trust you. Alternatively, if he admires your friendship with male friends, he totally trusts you. And believe me, ‘trust’ is the foundation of a strong relationship so this is something you must have in your relationship. Whether it is a handmade birthday card you gift him or your senile die-hard habit of touching your hair now and then, if he loves all those little habits of yours, he is a keeper. If he finds every little action of yours sweet and even mentions it to you, this means he is in love and you could be buying “he’s a keeper she’s a catch pillows” or glasses in no time. Remember when you are talking to him and after several minutes, you realize that it is only you chattering but he is listening to you intently with interest? If yes, then you are talking to the right person. It is common to notice men irritated when they do not like what is happening around. Men genuinely adopt an image of a tough exterior and robust interior right from their childhood and hesitate to expose their emotions in front of others. They find it sheepish to show to the world how they are feeling. But if my Jamaican man expresses emotions in front of others, then he apparently visualizes a trustworthy companion in me and could be the keeper of my soul. According to eHarmony, he’s a keeper if he feels safe to share almost every experience with you and expects a similar behavior from your side. You are the one whom he would refer to when he is not feeling right. If you feel the same way about him, you are about to show to the world what perfect couples look like! 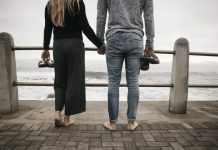 If you’re wondering if your man is a player or keeper, then think of this: Men typically do not relish giving to commitments and avoid talking about the future. The experts at Your Tango says, if your guy talks about future and intends to brew future plans with you and wonders where your relationship is heading, then he is in for a long-term relationship and he’s a keeper, yes he is! Well, is he a keeper or not? It might be difficult to find the perfect match in this era of digitization if you’re not using all of the resources to meet him. It’s okay if you sign up with a dating site to find him. He’s a keeper if your partner cares to show the above. He clearly yearns for you and do know he loves you. In addition, he is looking at your relationship in the affirmative and enthusiastic manner. Every person is meant to be with a quintessential person. You may need to wait a little longer, but don’t fear, he will find you. Just make sure you’ll recognize him when he does come along and don’t give him an opportunity to leave once he is yours and return the utmost love he showers on you.